Have your wood-burning fireplace inspected and cleaned by a professional chimney sweep at least once a year and more often if creosote builds up on the chimney walls rapidly. You may call your professional every 4-6 months to come out and check for any buildup or other issues. Between professional inspections and cleanings, monitor your wood-burning fireplace for signs of buildup or other problems. 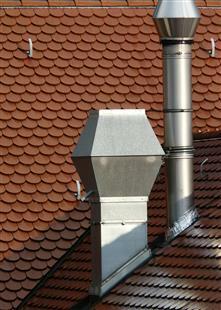 Your chimney has a cap (should have) with open sides (usually covered with mesh) to keep out rain, birds, squirrels and other animals, and other debris from entering the chimney. The cap should be inspected regularly and replaced when necessary. Check the interior of your wood-burning fireplace chimney for creosote buildup. Creosote is a dark colored or even black substance that can accumulate if wood isn’t burning completely. It is flammable, so a buildup of creosote is an absolute fire hazard and should be cleaned away with a creosote remover as soon as possible. Also, look for soot buildup in the chimney of your fireplace. Soot is softer than creosote, flammable as well, and should be cleaned out of the chimney regularly. If possible, burn hardwoods like maple, oak, ash and birch. The reason for this is that hardwoods burn hot and long; have less pitch and sap, making them cleaner to handle; and tend to cause less creosote buildup. They may be more expensive than softwoods, but seem to create fewer issues. Troubleshoot anytime there is smoke indoors from your wood-burning fireplace and immediately correct any problems that you find. 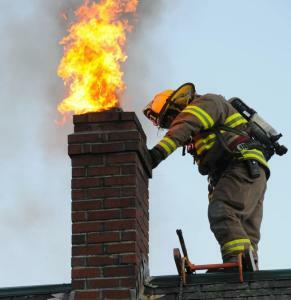 Possible causes of smoke are a dirty chimney with creosote or soot buildup, other debris in the chimney (or even deceased creatures), a damper that isn’t open or is only partly open and wood that is not burning completely. Clean your wood-burning fireplace interior including its floor regularly. Sweep out or vacuum up cold ashes. Wear a dust mask and gloves when cleaning the fireplace.